Wallace, Dorrans and Sadiq from the bench. 2-0 Rangers, after a bit of a slog. A chance to rest a couple of regular starters,and give game time to some. Any idea how many tickets have been sold? Another massive game for us, the league cup is hugely important as our players winning a trophy would give them the taste of success. Good game for others to get a chance, although I don't think we should be taking too many risks. Also when is the draw for semis? et/pens. draw after the game. Once again get that early goal and repeat from Sunday. Good luck Rangers lets add to our total of League Cup Triumphs. Is Grezda in the squad? Seen someone say earlier he wasn’t in squad. Hopefully he is as I would like to see him tomorrow. It would be good to keep the goals flowing from Sunday against st.johnstone. On the other hand could be a banana skin. Sadiq,Rossiter and Wallace from the bench. Not a bad suggestion at all but, with 6 youngsters apparently in the squad, I think it's going to be a little bit different from that. I suppose Middleton still may be counted as a youngster. Maybe start one of the midfielders (Kelly, Palmer, Thomson)? Is Andy Dallas going to get a chance? McCrorie (goalie) on the bench instead of AMcG? Spoiled for choice. Happy days. 3 or 4-0 and a chance to play the fringe players/get players some minutes/build some fitness. I'd be surprised if Tav plays tonight. Need to give him, big Connor and one or two others a rest. Loads of massive games coming up and need to use the full squad wisely. Bench, Robby McRorie, Candeias, Dorrans, Sadiq, Rossiter, Palmer, Kelly. I’d like to see a solid spine in our team. Why clearly? I thought it was suggested in press conference we’d go quite strong? That's the team I picked with one change Rossiter for Halliday. This MUST be a priority outside the leauge obviously. Win tonight and win the semi and hopefully the manky mob in the final with a level playing field supporters wise, Win well against them, get that monkey off our back and silverware in the trophy room where it belongs. Achieve this and sit back and watch, order pizza, order plenty pop corn, buy a lazy boy, it will be trueley Amazing the beginning of the end. DK must fire a few salvos at this time. BooM!!!!! So many sticking Grezda in their team. He isn't in the squad for tonight guys. A poster listed the squad on another thread mate. Lots of youngsters - no Grezda. Probably the Press Conference thread. Can’t find it. I’d be stunned if he wasn’t at least on the bench. Surprised he isn't in the squad mate,but as my post said-the team I've suggested is based on the staff thinking these players are ready to start the game-if that's not the case then obviously they don't play,and in fairness to the staff they seem to be making a helluva lot of right decisions on selection of late it would seem. It just seems like SG and GM have a lot of logic and common sense in their thinking,which isn't always the case with football management funnily enough at times.I think that's one of the big reasons why the support are so confident in them,myself included. Foderingham, Tavernier, Barisic, Flanagan, Katic, Goldson, Worrall, Wallace, Arfield, Dorrans, Halliday, Coulibaly, Ross McCrorie, Kent, Ejaria, Candeias, Morelos, Middleton, Sadiq, Palmer, Thomson, Kelly, Robby McCrorie. Sadiq (he needs a chance to show if he’s ever going to make it. If there’s no chance then Morelos). Sadiq has to at least get a meaningful amount of time. If he can't play in a game like tonight then thats a big worry. Would like to see Middleton start too. We don't want to see any of the "it's only Ayr United" attitude. Keep the good feel factor going, a couple of quick goals and get the job done. Good luck to the fringe players that get their chance to shine tonight. 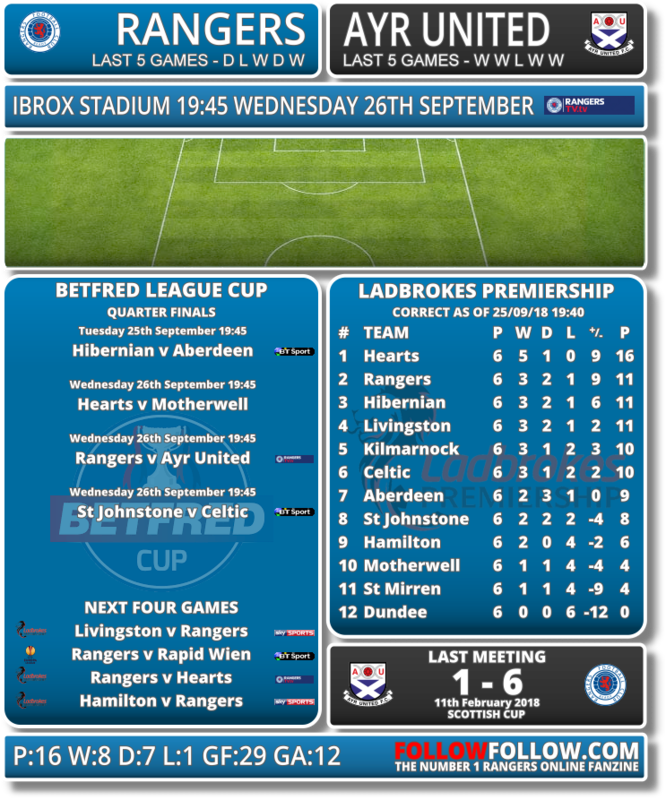 Tonight (Wednesday), sees Ayr United travel to Glasgow to take on Rangers in the quarter-finals of the Betfred Cup. The high flying Honest Men returned to the top of the Championship on Saturday with a 2-0 at Alloa and are the division’s last remaining representatives in the competition. The clean-sheet at the Indodrill Stadium was our eighth of the season and sixth away from home in just seven games while at the opposite end of the park, Lawrence Shankland took his tally to 15 goals in 12 games, nine of them coming in the league cup. Rangers resurrection under Steven Gerrard has seen them qualify for the group stages of the Europa League, having overcoming clubs from Macedonia, Croatia, Slovenia and Russia in qualifying. Last Thursday, they held Villarreal to a credible draw in Spain, before brushing aside St. Johnstone 5-1 at Ibrox on Sunday to climb to second place in the Premiership table. They have lost just once in all competitions this season, at Celtic Park at the start of the month, and only Croatians Osijek have avoided defeat in Govan. The Light Blues reached this stage of the Betfred Cup with a 3-1 win over Kilmarnock at Rugby Park. Colombian striker Alfredo Morelos scored a hat-trick against Steve Clarke’s side last month and Rangers will see the competition – which they have won more than any other side – as a great opportunity to lift their first national cup competition since 2011. Morelos – who earned his first cap for the Colombian national team in an international against Venezuela last month – leads the way as Rangers top goalscorer this season with seven goals, and captain James Tavernier has weighed in with five from right-back. Team News: Daniel Harvie comes back into the squad after suspension. The Honest Men’s only wins at Ibrox came in 1915 and 1959. Ayr and Rangers have met 11 times in the League Cup, most recently in the final of the competition in 2002, a match Rangers won 4-0 at Hampden Park. United’s only win came in a quarter-final second-leg tie at Somerset Park in 1953, a 3-2 win not enough to overcome the first leg deficit. Last Meeting: The sides last met seven months ago in the fifth round of the Scottish Cup at a snowy Somerset Park. Alan Forrest put United ahead in the 11th minute after ‘keeper Wes Foderingham’s error. Alfredo Morelos equalised 20 minutes later and it was level at half-time but Graeme Murty’s side ran away with it after the hour mark, scoring five goals without reply. Forrest was also on the scoresheet when the Honest Men last met at Ibrox, in April 2014. Bilel Mohsni opened the scoring in the 54th minutes before Forrest scored an equaliser in the League 1 encounter only for the Tunisian defender Mohsni to grab the winner with 8 minutes to go in the game. Think we'll probably see less changes than that though, guys like Grezda, Dorrans and Sadiq coming off the bench if we're comfortable after 55/60 minutes. I would be worried that Dorrans still isn’t fit to start. Bring him on second half. But, with Ejaria and Coulibaly also needing game time as they return, i’d be tempted to start with them. We must not under estimate any team. Then again, we must ensure we destroy teams when the opportunity arises. I would have thought Morelos would be one of the first to get a wee rest but suppose it depends how he feels and we are short of options in cf position. Should be another hammering anyway just need to be careful with Bobby Madman reffin the game and the weather hes been a wee bit quiet for a while but one of these "im nae Rangers man now" type performances is never far away. Red cards can make any tie or fixture difficult and the refs know that better than anyone, they love to send our players off. The squad feels so much stronger i’m Less concerned about players slotting in an out. Would like Sadiq to get at least 45 and hopefully get on the scoresheet and show up well to both boost his confidence and let us see he is at least an option if required. Id love to see them go 4-4-2 and play both Morelos and Sadiq tonight, think that having Morelos on there would take some pressure off Big Umar, might be a confidence thing and if he's up there on his own he'll be under intense scrutiny but also feel that El Buffalo apart from ripping the Ayr defence a new one could maybe serve him one up on a plate like he did Candeias on Sunday. Missing out tonight,hopefully a straightforward win. Hope to see about 30-35k. Atmosphere will be non existent I’m guessing but just hope it doesn’t affect the players who are used to a full house normally. How many of you guys are going? Let’s go! Like the thought but, especially with there likely being a few players coming back from injury and a couple getting brought into the first 11 for the first time, i’d prefer if we stayed in our usual formation. Easier for the returnees and better for the new starts to get experience of how we usually play. If we want 2 strikers on then we could go for Umar through the middle and Morelos narrow right. Wouldn’t have to be so focussed on back tracking with Flanagan behind him though that combination would dramatically narrow our right wing. Looking forward to getting back to Ibrox tonight for this one. Won’t be a walkover by any stretch, they are going well at the top of the Championship and in Shankland have one of the form strikers in the country right now. Would be nice for some fringe players to get a run out if possible but safe passage to the semi’s is my main concern. Strong team to start and a few subs in the second half if all going well I think. Is this the team? Was told this yesterday and I’ve seen it posted a few times in this thread. Coincidence?